Old & New Sand. 3-year-old Ben Lloyd plays in the newly installed sand last night in TOT LOT 116 in Riverside Park. The normal beige sand can be seen side-by-side with the new Ivory colored sand on the floor in the foreground. The new sand is mostly calcium and calcite. Sand has migrated to numerous areas of the playground causing an addional safety hazard. (Photos: Geoffrey croft/NYC Park Advocates) Click on images to enlarge. The Parks Department has apparently come up with a brand new way for children to get injured when they allowed rocky, gravel-like sand to be to installed in sandboxes in eight playgrounds on the Upper West Side. The sight of park workers wearing protective masks removing newly installed sand from sandboxes hardly instills public confidence. Last night the Parks Department began removing the dangerous sand after a 1-year-old child was hurt after falling face first into the abrasive material at the tot lot in Riverside Park at W. 105th Street and Riverside Drive. The boy suffered abrasions to his face according to his mother. The abrasive “sand" was installed five days earlier on May 6th as part of a Riverside Park Conservancy event. The Parks Department is now forced to remove the sand from eight locations. The dangerous sand was removed last night from TOT LOT 110 Ten, near W. 110th Street and Riverside Drive. 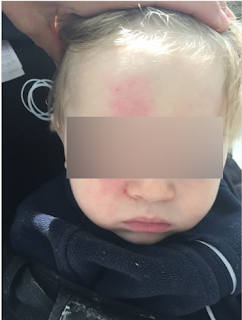 The issue came to light after an Upper West Side parent posted a message on social media warning the public to be careful this week, along with a photo of her injured child. "The tot lot on rivierside were supposed to be refilled with new sand this past weekend and instead the parks department ordered the wrong sand, " Danielle Alden posted on an Upper West Side mom facebook page. She wrote that the sand currently in the sandboxes, "contains bits of gravel and ground up rocks. The pic below is my poor kids face after falling on some of the sand. He had bits of rock and sand stuck on this face! I'm fuming," she writes. Danielle Alden posted a photo of her injured child on an Upper West Side mom facebook page after he fell face first into the sand. "Geez Louise NYC post a damn sign!" She advises the public to avoid the sandboxes until the sand is replaced by the Parks Department. Alex Lloyd, a geologist who teaches at Columbia University, examines the newly installed coarse sand. "This is not what I would be buying for my house, if I had a house." The new sand also leaves a chalky residue on users. Last night three-year-old Ben Lloyd was dutifully playing in the sandbox at TOT LOT 116 at 116th Street with the new sand. "It's definitely strange," said Ben's mother Eileen. "It's just so coarse. It seems like a weird choice for a sandbox especially for younger children." Her husband, Alex Lloyd is a geologist who teaches at Columbia University. He offered an examination and assessment of the material. "The difference between our two types of sand here - our newer sand is very coarse, I would say very juvenile if I had to use a geology word which means young and kind of sharp and angular, its not well rounded its almost like they crushed it for the purpose of making sand instead of collecting a nice natural sand which is what you standardly see in playgrounds," Mr. Lloyd explained. He said the new sand is, "mostly calcium and calcite," adding, "I wouldn't want to take my shoes off, its really sharp," he said. "I wouldn't be surprised if its cheaper." His wife said she has lodged several complaints regarding the missing slides in the playground which have not been replaced. The playground is also in dire need of regular sweeping as the sand has migrated to numerous areas of the playground causing an addtional safety hazard. Another parent called the new sand "uncomfortable" after sitting on the edge of the wall while watching her child play in sand box. The sand has not only migrated out of the sandboxes but also outside of the play areas creating a long dangerous trail along the sidewalk. Presumably the Parks Department will clean up this additional safety hazard. Not SandSational. Fresh sand means another thing for park users in Riverside Park. Volunteers installed the sand on May 6th - five days ago - in an event sponsored by the Riverside Park Conservancy and the Parks Department. A Mess. New sand has spilled out along the park sidewalk for blocks creating a safety hazard for all park goers.